I have a long history of trying out alternative clothing. Partly as an antidote to uncomfortable cuts and cloth, such as the ever-popular denim jeans and corduroy pants, and partly as in utter disgust to the homogenized styles blessed each year by the fashion police. Starting with Aikido doji pants, a comfortable but baggy bit of natural cotton, to the lungi, a sarong-like folding of a single lightweight sheet of fabric, anything was fair game. 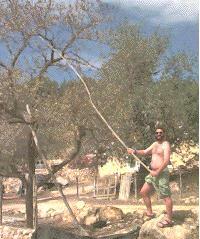 At right you see me on the Mediterranean island of Eivissa (Ibiza), beating almendras out of trees, during a 1995 book-writing semi-tropical junket. The almonds won. And don't even get me started on the strange things I've been seen wearing on the desert during Burning Man :-) The bottom line is that clothing is necessary most of the time, and I've been unhappy with many of my choices. Not that it's something I brood over, or even notice from month to month, but every once in a while something pops up which makes me realize how uncomfortable the default clothes I wear can be. From about 1986 to 1995 I had the pleasure to wear ChiPants, a pant inspired by meditation garb and martial arts clothing. Locally made from pure cottons, with gentle dyes, in a variety of styles, and featuring a seamless crotch gusset, these pants were a hit with the programming set (amongst others). If memory serves, over a quarter-million were sold, mostly by word-of-mouth. Alas, they're no longer available, mostly due to the [Santa Cruz, California] 1989 Loma Prieta earthquake. During those years, and after the ChiPants become too expensive, and finally unavailable, I wore out a lot of Gramicci long pants and shorts. When bifurcated pants aren't absolutely necessary, Utilikilt saves the day. Wow, what can I say about this amazingly comfortable piece of clothing that isn't rather obvious? It's a variation on the traditional Scottish kilt, made with a pleat pattern that doesn't lend itself to use with tartans (damn things wouldn't line up), is very comfortable, and looks even better with a wide belt.